Need some encouraging news? Contrary to popular myth, we are not irretrievably becoming more secular in the USA. There’s good news to be found in a recent Harvard study analyzed by Glenn Stanton in the Federalist, commentary by Gary Randall of the Faith & Freedom Network, and independent studies by Indiana University Bloomington and Pew Research Center. Here’s what three recent studies found. The Harvard report shows that U.S. Christianity isn’t only alive, but growing. This statement is difficult to believe with the media’s drumbeat of liberal bias. But powerful new statistics point to a resurgence of faith. In other words, Christianity is shifting — not dying. The number of people who read their Bible, go to church weekly, pray regularly has been “steel-bar constant” for the last half-century. “Patently persistent,” as Harvard calls it. It also happens to be in astounding contrast to other nations. The percentage of such people is also not insignificant. 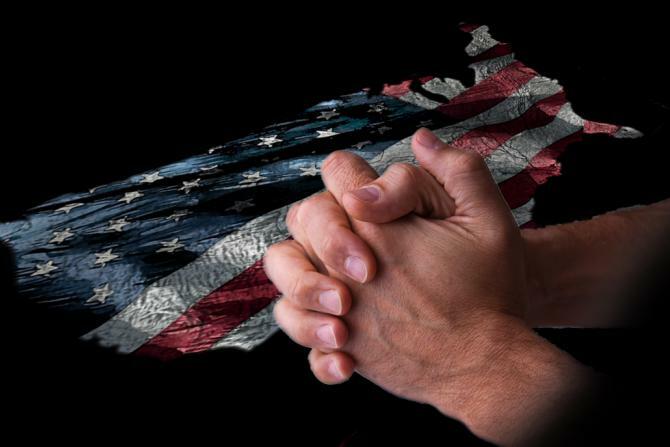 One in three Americans prays multiple times a day, while one in 15 do so in other countries on average. Attending services more than once a week continues to be twice as high among Americans compared to the next highest-attending industrial country, and three times higher than the average comparable nation. One-third of Americans hold that the Bible is the actual word of God. Fewer than 10 percent believe so in similar countries. Part of the reason for this consistency is the number of children Bible-believing people produce. Christian parents are outpacing the offspring of secular populations– and that’s helped to keep the fabric of faith alive. There is another factor beyond faith. The University of London’s Eric Kaufmann explains in his book “Shall the Religious Inherit the Earth?” (he says yes) that the sustaining vitality, and even significant per capita growth of serious Christian belief is as firmly rooted in fertility as it is in teaching and evangelism. Globally, he says that the more robust child-bearing practices of orthodox Jews and Christians create many more seriously religious people than those with a secular agenda. Here’s the kicker. Social Darwinism may be true, but just not in the way secularists think. Those who have babies and raise and educate them tend to direct the future of humanity. Followers of Christ are doing this. Those denigrating faith are not. So, why does it seem like secularism is over-running the United States? First, because of the sheer dominance of the liberal media and academia. We hear and see a “fake news” perspective everyday and tend to believe it. But they present only one side of the equation. All of these facts about faith should encourage us. The half empty part of the cup may still point toward the emergence of a secular progressive’ faith-hating society on the horizon–just as I spoke about last week. But the half full cup reveals that God is still at work and this should motivate us to seek His increasing showers of blessing. May there be a world-wide revival of exceptional faith in Jesus Christ. Very good Ron! Happy Birthday week to us both. I have been watching the History Channel on some of the Revolutionary War, Louisiana Purchase and Lewis and Clark expedition. Even though it was not produced with a “Christian perspective” I have been amazed how many sovereign acts and divine appointments took place in every phase of our country being founded.